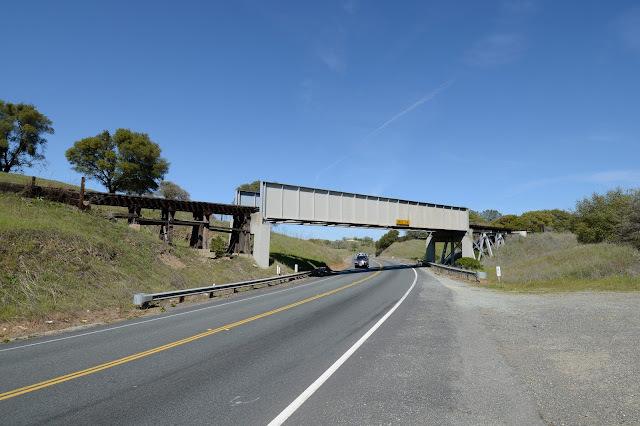 I couldn't find too many railroad bridges in Amador County. There were mostly at-grade crossings, usually without gates and I never saw a train. The East Ione Underpass (26 0004) is a 95 ft long through steel girder railroad bridge on two column bents and with timber and steel trestle approaches. The bridge was built in 1958 and it's in good shape. It crosses State Route 88 a little southeast of Ione near mines and quarries that include railroad sidings. Amador County, California Bridges: East Ione Underpass over SR 88 by Mark Yashinsky is licensed under a Creative Commons Attribution-NonCommercial-ShareAlike 3.0 United States License.